This is a movie-related iphone app that I'd actually use. Thought I would recommend. It's called "My Daily Clip". Description: My Daily Clip is the ultimate daily companion for every movie fan. Receive a new movie clip on every day of the calendar year and search by special themes to unearth a classic scene, share a teary moment, or access action and adventure. 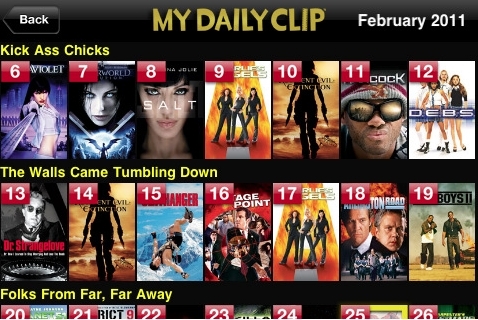 My Daily Clip delivers perfectly edited and high quality video, served via adaptive streaming, to optimize the user viewing experience. Connect with Facebook to share clips with your friends, test your knowledge through embedded movie trivia, or purchase the feature-length movie directly from iTunes all from inside the beautifully designed iPhone and iPad application. You may not have time for a feature-length movie, but you always have time for a clip. My Daily Clip.